Yes, yes... I know I've been really slow in updating this and it's been quite a while now. Well, what can I say...? I wish I could blame it on the World Cup but really, it was not just that. But who am I kidding? Of course it was mostly because of the World Cup! All of us had very little sleep in the whole month of June and early July because of this phenomena that is REALLY new to me but even I got sucked into it! Mommy, Dadda, Tok Abah, Tok Mama, Pak Su, Adida (Aunty Huda) and everyone else's life had revolved around it. Even Mommy came back from work on time everyday! We had to make appointments and inform everyone before hand whenever we meet or have family gatherings but once World Cup started, our schedule automatically became one. We didn't have to call each other to ask. When the time came, we drove over to Subang Permai (which I call 'Princess' Garden') and everyone will be there. It was amazing! First there was a small gathering at Tok Mae's house to prepare for Umi Putri's engagement ceremony. In the Malay culture, before we get engaged, we'll have a small get-together to discuss and get to know the future in-laws. Two weeks ago, Umi Putri's engagement ceremony was held at Tok Mae and Tok G's house in Taman Melati, a month after the small gathering. And then, it was Umi Aida's turn to get engaged. The ceremony was held last Sunday in Tok Amaz's and Tok Pah's house in Seremban. It was a humble but fun and joyous evening for all of us. 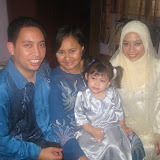 With the lovely couple, Ummi Put & Uncle Irsyad.. These had happened on every single weekend of June and July so far and it's not about to end! Next weekend there will be Nek Wan's tahlil for arwah Nek Tok in Rembau. Then, Pak Su's convocation will be on the final week of July which we will celebrate with a barbecue party with the whole family on the 31st of July. That'll leave us with only 1 weekend before Ramadhan and fasting starts. I heard that we might have something to do on that one last weekend too. I'm also anticipating my Ramadhan weekends to be filled with buka puasa (breaking fast) event and gatherings right on till Eid and even then, my Eid weekends will most likely be filled with open houses too! 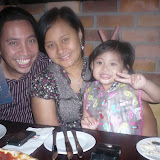 Phew... what a great and hectic 2 year old life I'm having... but I LOVE IT!